HAMSA \ SHALOM AL ISRAEL (MOTIVES). 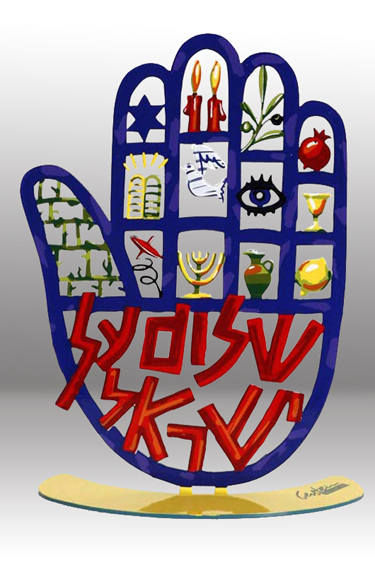 Size: 22 x 17 Cm year: 2007 | medium: Metal | edition: Unlimited | series: HAMSA | type: Free Standing | SERIGRAPH ON STEEL | A painter and a sculptor, an excellent draughtsman and a craftsman, the Israeli artist David Gerstein seeks to expand the limits of the two-dimensional paintings into three-dimensional sculptures. In his choice of subject matter he wishes to break down the existing barriers between the work of art and its audience, by creating enchanted and simple straight forward images, which render sometimes intimate, dream-like, na?ve scenes and another times a cinematic, large scale, choreographed reality. His easily recognizable artistic syntax have developed gradually, reflecting a search for a unique voice, which ranges from local to the universal. His art maintains a conscious interplay between the hand-made "original", "unique" work of art and the reproduced work of art; between high art and low art. Gerstein creates universal colorful and layered images of still-life compositions, urban landscapes and human activity, witch always retain local and autobiographical elements. His versatile body of works consist of indoors wall-sculptures formed as multi-layered cutouts, outdoor works, sculptures, paintings, prints, drawings, and designed objects including jewelry, which can be found in Museums and galleries, indoor and outdoor public as well as artifacts and design shops in Israel and around the world.